One aspect of Yank Wilson that's definitely worth mentioning is the reason I chose the images above for him, from Fantastic Comics #6. 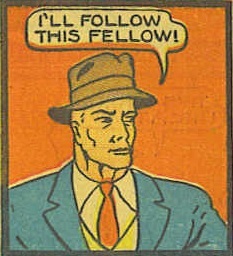 He's one of a select few characters to be written and drawn at some point by Fletcher Hanks. Hanks is the creator behind such Golden Age gems as Fantomah and Stardust the Super Wizard. His work has grown in popularity over the past several years with the publication of the collections I Shall Destroy All the Civilized Planets! and You Shall Die by Your Own Evil Creation! (which also give some insight into the rather tragic life of the artist). If you've never read Hanks' stuff, I strongly recommend you work to correct that. He's become a must-read author of the no-holds-barred insanity that was sprinkled throughout the Golden Age of comics. His Yank Wilson story is easily one of the tamest Fletcher Hanks works you could read (and is probably one of the tamer Yank Wilson tales). I'd recommend heading over to Fantastic Comics #1 and reading the Stardust story that starts on page 16 for a pretty good intro to the mind of Fletcher Hanks. 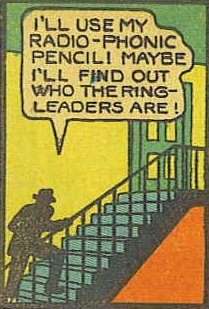 I wish I had a radio-phonic pencil. Keep an eye out for my Kickstarter.